Centre, Mike Collier, Headteacher of Walker Riverside Academy, with, left, Robert Whitelaw, a director of Tyne Coast Academy Trust, and Walker Riverside Academy chairman of governors and Walker councillor, Dave Wood CBE. Tyne Coast Academy Trust is a Multi Academy Trust (MAT) which is sponsored by Tyne Coast College, formed last year from a merger of South Tyneside College and Tyne Metropolitan College (TyneMet). The move, officially approved by education secretary Damian Hinds, has seen Walker Technology College’s name change to Walker Riverside Academy. It will now be supported in its future ambitions by Tyne Coast Academy Trust, which works with chosen education bodies that share a collective vision for excellence. Dr Lindsey Whiterod, chief executive of Tyne Coast College and head of Tyne Coast Academy Trust, said: “By becoming an academy supported by Tyne Coast Academy Trust, learners at Walker Riverside Academy will gain the best possible educational advantage. 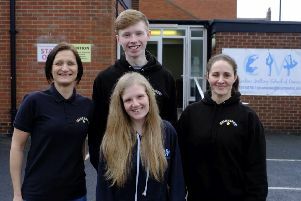 He added: “Walker has always looked to get the very best for its community, so it is indeed no surprise that the sponsor for Tyne Coast Academies Trust, South Tyneside College, was seen as the National FE College of the year for 2017. Under the change of governance, funding for Walker Riverside Academy has switched from Newcastle City Council to Tyne Coast Academy Trust. Granting academy status, Mr Hinds said: “Academies form an integral part of the Government’s education policy to raise attainment for all children. “I am delighted that Walker Technology College recognises the benefits academy status will bring. “Your academy will now have the opportunity to use the freedoms and flexibilities of academy status to share best practice and work with others to bring about sustained improvements to all schools in the area. Tyne Coast Academy Trust was previously called South Tyneside Multi Academy Trust but changed its name when South Tyneside College and TyneMet merged last August. It aims to support the development of high-quality teaching and learning, develop curriculums that meet the needs of businesses and students, and work in partnership with the region’s communities, agencies and employers. The trust provides financial support, procurement, budget setting, and prepares statutory accounts, and deals with audits and returns to the Government’s Education and Skills Funding Agency. Education bodies within it also benefit from increased purchasing power and economies of scale, which can help reduce costs. Established in 2013, its principal success has been to support Ridgeway Primary Academy, a once failing school in South Shields, to dramatic improvement. In November 2016, Ridgeway achieved an improved Ofsted rating of ‘good’, and the following month was named the country’s most improved mainstream primary for progress in writing at the end of Key Stage 2. At the same time, it was listed as the thirteenth most improved in reading, writing and maths combined. Ofsted ‘good’ rated Walker Riverside Academy has around 1,100 students aged between 11 and 19. The academy’s curriculum includes English, maths, science, history, geography, music, media, drama, sociology and modern foreign languages. Its business and industry curriculum comprises of business studies, engineering, construction, computing, food and nutrition, child care, hair and beauty, health and social care, and leisure and tourism.